Phoenix Lander heading to Mars in 2007. The answer to the question about life on Mars may very well come from analyzing an unsuspecting source—the soil, specifically the icy layer of soil underneath the red planet’s surface. By analyzing the properties of Mars’ frozen layer of soil during NASA’s next lander mission, scientists will be able to better understand and theorize about life on Mars. A synopsis of the project will be presented by Douglas R. Cobos, Ph.D., on Monday, July 10, 2006, during the 18th World Congress of Soil Science in Philadelphia. Cobos is a research scientist and engineer at Decagon Devices, Pullman, WA. NASA is working with Decagon, a soil science equipment manufacturer, on designing a probe to take soil and atmospheric measurements during the Phoenix 2007 Scout Mission. Galon Campbell, founder of the company and a soil scientist, designed the probe and, together with Cobos and Colin Campbell, is a co-author of the paper being presented in Philadelphia during the international World Congress of Soil Science. Cobos said the physics on Mars is such that ice tends to go directly from the solid form into a vapor. “If we can measure this liquid water using our specialized sensor mounted on the robotic arm of the lander, we’ll be able to turn over the data to the planetary scientists to analyze the climate and conditions on Mars,“ says Cobos. These scientists will use the data to determine if life ever arose on Mars or if it could sustain life in the future. Cobos, who has been working on the lander’s sensor for two years, just returned from the Jet Propulsion Lab where they mounted the sensor to the arm of the lander and calibrated it. 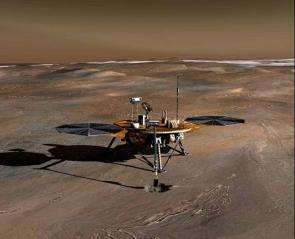 The Phoenix Lander is planned to take off in late 2007 and arrive on Mars to begin its discoveries in early 2008. For information, go to: http://www.18wcss.org.